Are you looking for the right lightweight mobility scooters in West Kirby? Mobility scooters help the elderly and disabled individuals get around at their own convenience helping with retaining their independence. Easi-Way are the north-west specialists in mobility aids and products, with a great reputation for selling top of the range mobility scooters at great value prices. 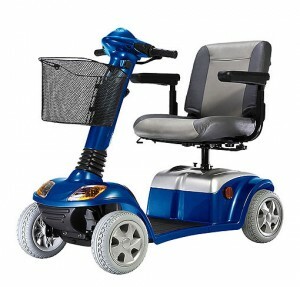 They only sell products that are made to the highest standards, whether it is the range of mobility scooters, wheelchairs and power chairs, or profile beds. These are all made by leading manufacturers. In West Kirby, lightweight mobility scooters are affordable at Easi-Way Mobility. This family owned business understands your needs and they offer a top rate customer service. Visit their Wirral showroom and have a look at the mobility scooters they have on offer. You could take it for a test drive to determine if it is comfortable and easy to drive. Choose from the Invacare scooter range, the Kymco scooter range or the Eclipse range. Each range of mobility scooter has advantages to suit your particular needs. The Kymco range is noted as being lightweight and easy to manoeuvre and is available in graphite, red or blue. Lightweight mobility scooters in West Kirby are an excellent way to retain one’s independence. Using a mobility scooter will enable you to get to the shops or move around your own home without having to depend on someone else for assistance. Easi-Way Mobility, apart from selling top of the range mobility scooters, also specialise in providing a wide range of mobility products such as profile beds, power chairs, incontinence products, nebulisers, daily living aids and recliner chairs. Give them a ring, or better still, pay them a visit, their friendly team are always happy to answer any questions that you have, whether it involves purchasing advice or any other queries you may have. For more information about lightweight mobility scooters, contact Easi-Way Mobility.